AMSOIL synthetic brake fluids surpass Department of Transportation (DOT) requirements and provide racers with a brake fluid that delivers superior high-temperature performance preventing brake fade and vapor lock. 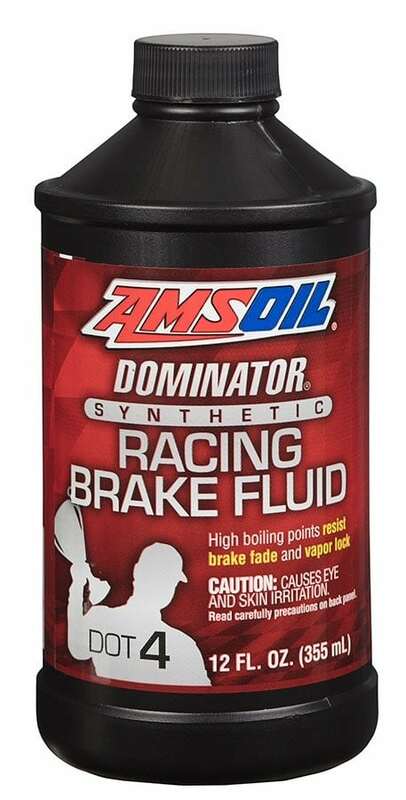 AMSOIL DOMINATOR® DOT 4 Synthetic Racing Brake Fluid features ultra-high boiling-points of 410ºF (wet) and 580ºF (dry). It maintains a low compressibility during the most extreme racing conditions. *Dry equilibrium reflux boiling point (ERBP)–the boiling point of new, freshly opened brake fluid. **Wet ERBP–the boiling point of brake fluid having absorbed 3.7 percent water. Only 3.7 percent water contamination is often sufficient to reduce a DOT 3 fluid’s boiling point below the DOT minimum. The extreme pressure and high heat common to brake systems can push brake fluid beyond its boiling point, causing it to vaporize or “boil-off.” Water contamination can accelerate the process. This leads to a spongy or unresponsive feeling in the brake pedal (vapor lock). In contrast, the unique chemistry behind AMSOIL synthetic brake fluids increases boiling points well beyond DOT standards, even when contaminated with 3.7 percent water. AMSOIL Brake Fluids maintain a stable viscosity over a wide temperature range and flow easily at the high pressures generated in today's automotive brake systems to deliver solid, reliable braking. A nitrogen blanket is added to each bottle during manufacturing to purge moisture and ensure the maximum level of performance. 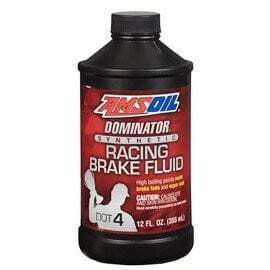 Use AMSOIL DOMINATOR® DOT 4 Synthetic Racing Brake Fluid in racing applications that require a DOT 4 product. Change fluid once a year for maximum performance. 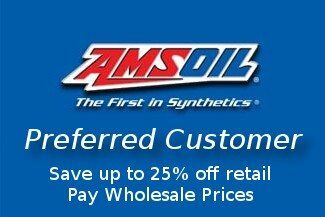 Consult the AMSOIL Product Guide at www.amsoil.com for more application information. This product is not expected to cause health concerns when used for the intended applications and according to the recommendations in the Safety Data Sheet (SDS). 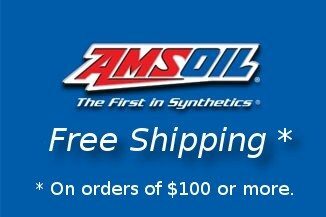 An SDS is available online at www.amsoil.com or upon request at (715) 392-7101. NOT AVAILBLE IN CANADA. Keep Out of Reach of Children. Recycle used fluid and bottle.